Ethel May Dell Savage was born in a suburb of London and grew up in a middle class family. She began writing passionate stories, usually set in India, at a very young age. Her works were considered "racy", though she was considered shy and very quiet. Her cousins made sport of circling her frequent use of words like "tremble," "passion," "pant," and "thrill." 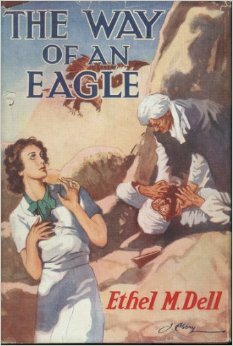 The Way of an Eagle (1912), her first novel, after being rejected by eight publishers, was reprinted thirty times by 1915. Readers loved her novels, though critics hated them with a passion. She was derided by the likes of George Orwell, whose lead character in Keep the Aspidistra Flying (1936) made scathing comments about Dell. She did not care, her readers remained loyal, and she continued making a fine living as a romance storyteller, though she remained shy and reserved all her life, rarely allowing photographs. She died of cancer at 58.